“The Edo period began in the first decade of the 17th century and lasted until the country opened to the West in the 1860s. That was a period of a little over 250 years. It was remarkable in many respects culturally, technically and economically because it was preceded by centuries of civil war and also of economic and military expansion overseas. The country basically had exhausted itself, had exhausted its resources. It had deforested most of the country, it had damaged its capability for agricultural production, the population had increased and the country was on the verge of environmental collapse, mainly caused by the deforestation. But over the course of the first few generations of that period, through very wise policy making and the ability to use people’s traditional knowledge, their understanding of their local environments to apply these new policies, this was reversed. The environmental degradation was largely reversed, regenerative forestry practices were introduced and means were found to introduce agricultural production to support a growing population which was then kept stable. The rest of the period had a steadily increasing quality of life by all our current measures in terms of lifespan, health issues, education, housing and so on. It was a period when the country was isolated. 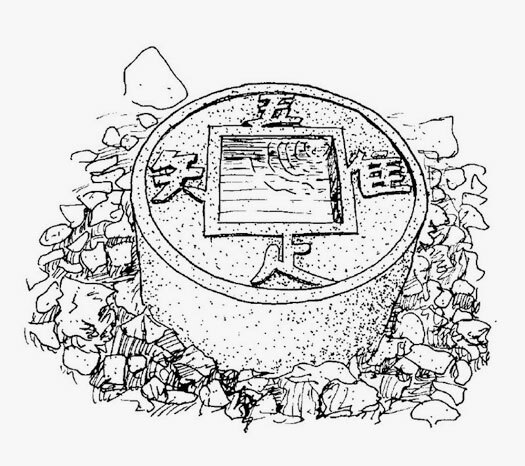 The regime, the Shoguns, had a strict policy of isolation, of not having much economic or political interchange with the outside world at all. It was a conscious turning inward and a conscious degrowth period in terms of the economy, and had very many positive benefits for the society. It was considered to be the period where most of what we consider to be traditional Japan, the great arts, the great woodblock prints and architecture, this is considered to be the period where that was born and when that became very common. At the root of this was a great store of traditional environmental practices which were very well utilised at this time. This was something that I spent a lot of time learning about and trying to communicate in my book Just Enough. You argue that that period gives insight into what it’s like to live in a sustainable society. In what way? This is really one of the big problems that I saw. That we don’t have many models for what a successfully run sustainable society might look like and how it might work. The Edo period of Japan was one and it’s certainly not the only. I’m sure in other Asian countries there are very many similar practices, but because of its peculiar lack of resources for instance, the specifics of the situation in Japan, an island nation with not a lot of arable land for agriculture. There were quite a lot of pressures that they went through that have great parallels with our own period. So, diminishing energy sources, in their case it was primarily wood for burning and charcoal. A growing population, difficulty having enough agricultural land, the pressure between how much land you allow for agriculture and how much for cities. Lots of the issues that we’re facing now were things that they faced. They did not have climate change/global warming – fortunately. They had very abundant and good fresh water, which we are now facing a very great difficulty with globally. So there are some cases where the parallels don’t fit, but otherwise it was a very good match. When I set about to write the book I thought one of the best ways to do it would be as a travelogue, as if we were visiting people in rural villages for instance, in cities, a visit to a workman or a samurai in the city, and see how they worked and how they lived and how the interconnected systems that they had developed for maximising the use of their environmental resources without degrading them. You mentioned that the Edo period came about as a response to the near collapse of society due to degradation and the environmental crisis. How did they turn that around? And perhaps most relevant to our current predicament in terms of climate change, how did they mobilise people to do that? It’s really interesting. We can divide it into the technical steps that were taken, the social steps that were taken, the political steps that were taken. They’re all connected. The first thing was to reverse deforestation and this was done by some very strict forest protection laws. There were laws on the books that stipulated the death penalty for anyone entering a protected forest with an axe or a cutting tool. We don’t really know how often this penalty was enacted but the fact is that was how carefully they wanted to protect these forests. The populace was involved in monitoring their environment and had always been actually, through something called the satoyama which is a set of practices of utilising and monitoring the surrounding environment. Japan is very mountainous. Most villages are in the valleys, and they were using the surrounding forests in the mountains for their fuel, for supplementing their diet with mountain vegetables and mushrooms and fruits and things like that. They were constantly monitoring and taking care of this environment. For instance, in the case of fuel, this was an ethical issue that’s always been part of the society, the strong ethics of not wasting things and being careful to leave enough for the future. In the case of fuel, people were not allowed to cut down trees to burn for fuel. They were only allowed to use what had fallen naturally, the fallen branches and so on. And if a community was living in the same place for centuries, for generations, they knew what the normal carrying capacity of that environment was in terms of things like fuel. They would limit their fuel consumption to their known supply and this preserved the forest from being unnecessarily cut and basically this was not necessarily such a legal restriction as it was an ethical and social one. So these kinds of tie ups between the overall necessities that were recognised and somehow documented and quantified by the government, and the traditional ethical, moral and knowledge based practices of the communities themselves were very well unified and served on the whole to preserve the environmental resources. Reading ‘Just Enough’ with a background in permaculture and having been a permaculture teacher for a long time, I look at a lot of what you have in there and think – it’s design. That everyday life was underpinned by an incredible amount of sensible, common sense design, it was a design project. That everyday common sense design that underpinned so much of what you document in the book, did people learn that consciously? Did they absorb it mostly by osmosis? How was that culture infused with good design? It’s a really interesting question, because design ultimately means making decisions about how to make, build, shape, use, transform things. I would like to argue that for the most part these were very consciously and continuously evaluated decisions. 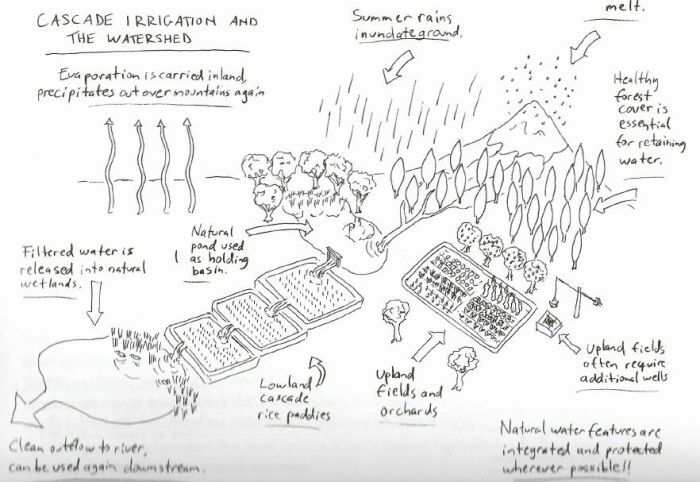 How do we bring the water to our fields without disrupting the natural ecological functioning of the places we’re bringing this through? 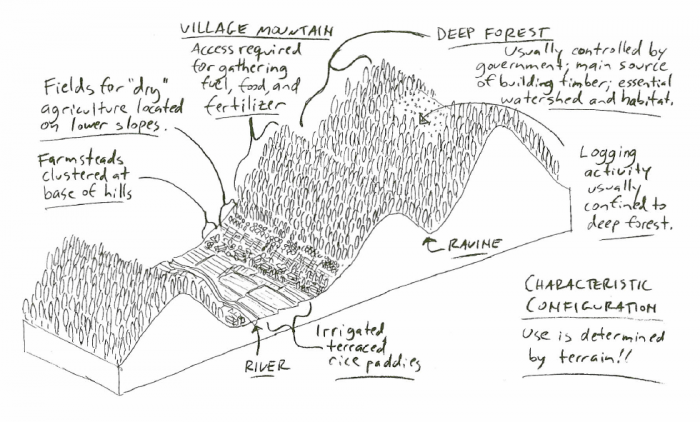 Let’s use gravity, let’s use the natural watershed as much as possible. Ok, we get to a certain point and we need to dig channels for the irrigation water. How do we do that in the best way? They are conscious decisions, and yet they are also techniques that are tested over time and handed down through generations. It helped that Japan was a very literate society at that point. A higher literacy rate than any European country, certainly higher than North America even though it was socially stratified. It was a caste-based society and some of the lower ranks may not have had a high literacy rate. There were lots of things that were written and analysed and put into books, and the books were fabulously well illustrated so that even people who couldn’t read could look at the illustrations like a comic and say – oh, this is how we dig an irrigation ditch or build a trellis for these fruit trees. It was a wonderful combination of educated analysis and handing things down through the oral traditions. Design was everything. And it was reflected, I think, in both the overall large-scale infrastructural urban planning, town planning, architectural planning aspects as well as the design of small things used in everyday life, the cups, bowls, boxes, furnishings etc. Was it a more equal society than today? It looks like it was very caste-based and stratified, but was there much potential for social mobility? How does it compare to today, do you think? This is probably the one area where we would find it the most wanting. It was clearly a caste based-society. Several classes of people, the military class, the Samurai, were at the top maybe 10% of the population, but they dominated most of the wealth and property as in any feudal society. Interestingly, the second ranking class were the farmers. Farmers were considered to be more of an elite and important part of the society than merchants were. Merchants were on the lowest rung of society. Economically, they ended up making a lot of money and becoming very powerful instead of that, so the social structure placed value on the role of peasants, of farmers, of the people who actually provide the food and who form the bulk of society. There was very little mobility. It was purely hereditary, and as in many societies like this, this ultimately became one of the reasons why it was unsustainable and led to this catastrophic and dramatic collapse in the 19th century. We would say definitely it was not an egalitarian society, and yet the fact that farmers were considered to be ethically, morally, socially superior to businessmen is really an inversion of our current value system. Margaret Thatcher had a press secretary called Sir Bernard Ingham who once famously said “I have one word for environmentalists who would take us back to the 18th century – dentistry”. I wonder whether you’ve been accused of over-romanticising a time that we’ve progressed from and is best consigned to history? Of course, as anyone who’s promoting these ideas probably has, and yet I try to be careful to point out that I am not advocating returning to the specific practices, to these specific ways of farming or of building or of doing anything. But for understanding how they perceived their environment, how they addressed problems, and I use the expression ‘a multiform solution’ because in any situation during that period it seems if they were thinking about how to address something like let’s say the water problem, they would look at the connections – at how the issue of water is integrated with others. One example would be – if they want to provide hot water, for instance for bathing, then they could do this in a way that did not damage the water supply itself and that also made optimum use of the fuel available, then they were effectively addressing what we would perceive as two different spheres of interest with one solution. They did this constantly. Another prime example involves the use of human waste for agriculture. Again, we can find lots of reasons to oppose this these days, in hygienic terms, which in fact is probably not necessarily the case. Whereas in the West, in European cities and North American cities, human waste was eventually collected in these horrible cess pools which as we know led to cholera and other diseases. In the 19th century when we developed indoor plumbing and flush toilets, it helped with the hygiene but then this stuff is being dumped into our rivers where it’s polluting them. It was really not a very good solution. The Japanese solution during the Edo period was that farmers would use human waste for fertiliser for their agricultural fields. Before this they were only using what’s called green fertiliser, organic matter, leaves etc, the nitrogen-rich things that they would put on the fields as fertiliser. There were also other fertilisers available like the remains of sardines that had been pressed for oil or rapeseed that had been pressed for oil. These things were good fertilisers. But using human waste increased agricultural productivity many fold. Having farmers go into the cities and empty out the latrines increased the hygiene levels of the cities themselves. There were no reported outbreaks of cholera in Japan until the Modern period in fact. This also became a market where if you were a landowner in the city and you had lots of rental properties and those renters used a set of latrines on your property, initially you would have to pay someone to clean it out but as time progressed they were paying you to cart the stuff off, it was so valuable. This was providing several benefits. One specific technique provides benefits in terms of agriculture, in terms of health, in terms of economy, and also others. These are the kinds of solutions that Japan of the Edo period found everywhere. How to reuse things, how to recycle things. How to transform what they have into everything they need. They always looked at it as the big picture of how these things could provide many benefits at once. It’s the opposite of our specialised viewpoint, I think, where one person knows how to do one thing and that’s it. I loved the bit about how people were paid for their sewage. It’s just so beautifully counter-intuitive to how we do things today. It really is – you’ve looked at composting toilets, bio-toilets and these have been developed for decades. If you look at our situation, because we do pollute our fresh water system with our waste then we need to purify the water. And we need to use the energy and have infrastructure for this and use chemicals etc. It’s crazy. 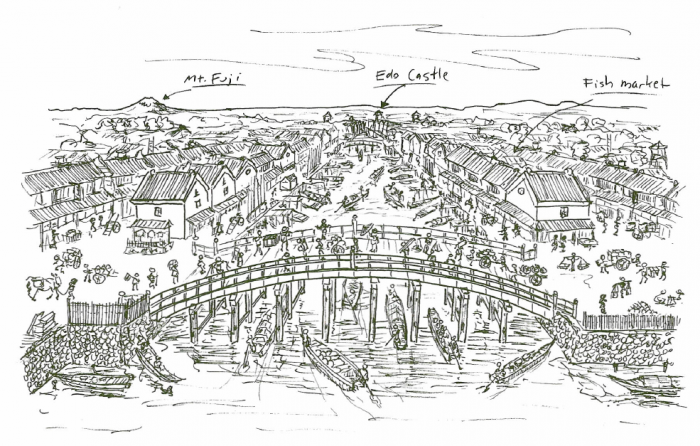 During the Edo period, the main river of Edo, which was the town that was eventually renamed Tokyo, they said the water was clean enough, if not to drink, to make tea from. As if you were in the Thames in the 18th century and dipped a teapot into that muck and make tea from it! It was clean enough to do that. In terms of this idea of being paid for your compost, so to speak, you had a composting toilet in your house and once a month someone came to clean it out and gave you $5 or $10 for it. It’s crazy to think of this now.